We're staying with the catch for today's umpire edition of Tmac's Teachable Moments. Umpires like to use the phrase that we have two ears and one mouth for a reason. We also have two eyes, and those come in very handy when it comes to adjudicating the completion of a catch. 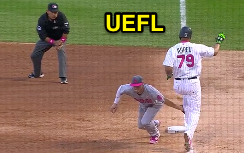 Today's Teachable Moment looks at a play where 1B Umpire Alfonso Marquez uses his eyes and is so relaxed and seamless in his mechanics, thanks to some excellent timing. U1 Marquez follows the ball, not the foot. Fonzie's play begins as a routine ground ball to third and, even after a slight misplay, the end result should still be an out. 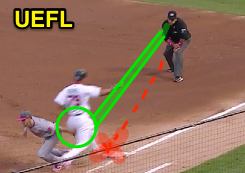 Marquez is focused on the 1st baseman's right foot which he correctly judges to have left the bag before secure possession is garnered by the 1st baseman. Here is where the play becomes complex. Fonzie IMMEDIATELY goes to the glove and looks for a tag (with a pulled foot, a tag is the only logical way the fielder will be able to put out the runner). Think this is easy? It's a skill acquired over 1000s of repetitions whether you have a play at first base with a pulled foot or not. Marquez sees the tag attempt and is so focused, he follows the ball as it caroms out of the 1st baseman's glove and rolls toward second. Fielder's glove collides with runner's leg. Sidebar: Quick Rules Review regarding interference. OBR 6.01(a)(10) puts the runner out for interference if he "intentionally interferes with a thrown ball." The MLB Umpire Manual interpretation extends the out call to a tag attempt: "While contact may occur between a fielder and runner during a tag attempt, a runner is not allowed to use his hands or arms to commit an obviously malicious or unsportsmanlike act—such as grabbing, tackling, intentionally slapping at the baseball, punching, kicking, flagrantly using his arms or forearms, etc.—to commit an intentional act of interference unrelated to running the bases." Batter-runner Abreu's interaction with F3 Myers is not intentional interference, and, regardless, the question of interference is not subject to Replay Review. Watch the catching action to its conclusion. As far as the definition of a catch, "In establishing the validity of the catch, the fielder shall hold the ball long enough to prove that he has complete control of the ball and that his release of the ball is voluntary and intentional." Although the parameters of Replay Review allow for a batter/runner to be ruled out via video review at the moment the ball first touches the fielder's glove (provided the fielder maintains simple possession and at some point gains secure possession), the fielder must nonetheless hold onto the ball "long enough" to demonstrate complete control. In other words, real-time calls should never really be made at the moment the ball first touches the fielder's glove: good timing generally means waiting until that specific phase of the play is complete before making a call. As for Wil Myers, he never really had complete control nor secure possession. Here's the finale. There's no need for a theatrical safe call here. Marquez gives a relaxed obvious safe so as to not draw unneeded attention to himself on this complicated play. Notice how he watches the ball as it leaves the mitt. This is a thing of beauty. This strategy applies to any catch play. Let's change the play to any routine catch—a fly ball to the outfield, line drive in a trouble spot, or thrown ball to first base, it doesn't particularly make a difference. Follow the ball until it's released from the glove. Make sure you follow the ball or the voluntary release. This stops from the potential disasters of turning away and having the fielder drop the ball and you're watching a tag up. Speaking of tagging up, yes, the runner can leave the base at first touch, but, again, what benefit is there for calling an out right away other than a potential missed call, and how can a fielder demonstrate that he has "complete control" and that "his release is voluntary and intentional" if the out call is made before the fielder has a chance to release the ball? A faster calling cadence may be appropriate for some calls due to the smaller time window which they are defined by (e.g., fair/foul, interference, obstruction, or an out of the base path call, to name a few), but catches are not one of them. 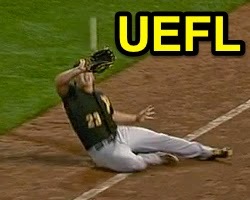 A fair/foul call will precede the catch/drop call. We saw this during the 2017 NCAA Baseball Super Regional on a fly ball to right-center, initially fielded by the outfielder, who dropped the ball during the transfer action, but ruled "no catch" by the first base umpire. Bearing in mind that college has slightly different mechanics for fly balls in the four-person system, there should still be an eye on this play through voluntary release. By the time the ball is out of the glove, much less on the ground, it's too late to travel back and try to reconstruct how it got there. Quicker timing is appropriate for some calls. So, what did we learn here? That Alfonso Marquez is a great umpire in the prime of his career. We also must realize this play isn't easy if you are looking at the wrong thing. Once you no longer have a foot on the base (on a thrown ball to first situation), go to the glove, which may require an adjustment in head or even body positioning. Next, have good timing. Don't sell a pulled foot or a tag until the play is complete. This is the dictionary definition of good umpiring and it's no surprise who the umpire is. Lastly, have fun.